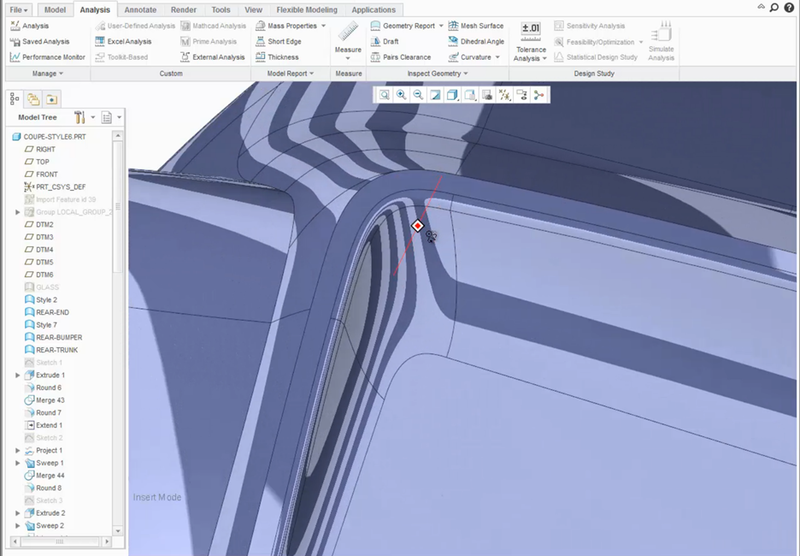 One major enhancement in PTC Creo 3.0 has been the addition of chordal or constant width rounds. 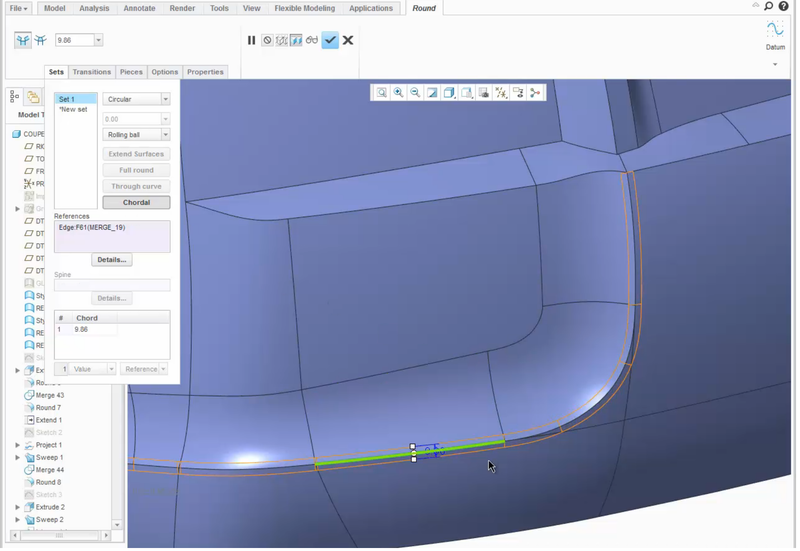 This new round option allows the creation of more aesthetically pleasing geometry by maintaining a constant width along the whole of the round length and eliminates the tedious process of having to construct round geometry using surfacing techniques. Users have the options of using circular, conic and C2 continuous rounds. 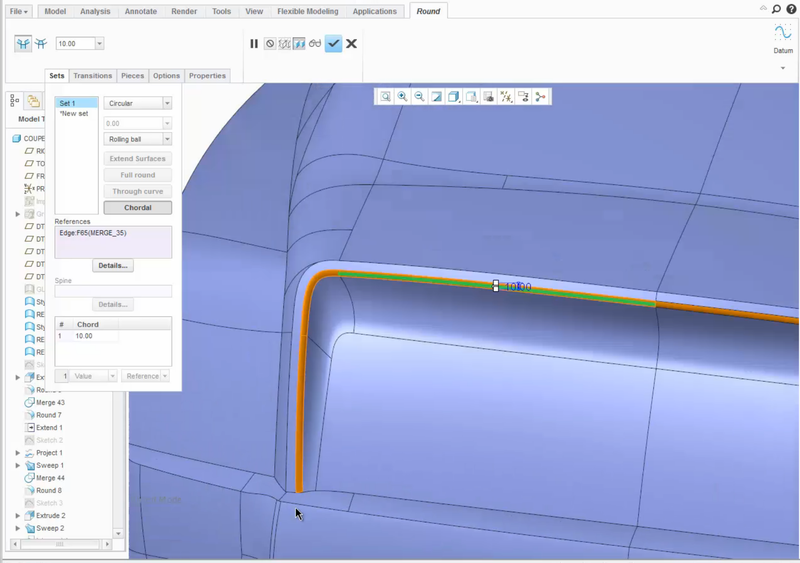 In PTC Creo 3.0, we’ve added the chordal, or constant width round, option to give you an easy way to maintain constant widths for the entire length of the round. In this example, we’ve applied a round to the edge of the model. The transitions at the ends of the rounds blend toward a triangular patch. With chordal rounds functionality, this can be changed. Then, when changing the value of the round you can see that the round maintains its constant width. Within the round user interface, click “Chordal” and you will see the round maintain a constant width. In the next example, we will add another round to a transition which blends to a 3-sided patch or point. Again, in the round user interface click “Chordal” results in a constant width round. From here, you could also select C2 continuous to change this round to curvature continuous. Changing the shape factor will alter the cross sectional shape of the round. You can apply a reflection analysis onto the geometry by clicking “Analysis Reflection.” From here, you can see how cleanly the reflection lines transition across the patch structure. Check out our video tutorial on the PTC University Learning Exchange (“Chordal Rounds”) to learn more. Can someone please advise....any rounds created prior to Creo 3 do not seem to have the ability to utilize the Chordal enhancement (the click button is grayed out for legacy rounds). Is Creo 3 working to product specifications here, or do I have an alternative solution to get my old rounds communicating nicely with the new programming? Other than re-creating all of the rounds in Creo 3? Thank you in advance for your feedback.